All over the world, people are making predictions about the future of reading. There is debate about print versus digital formats, gloom about the future of publishing companies and print newspapers, and angst expressed by almost every stakeholder. But one thing there is general consensus over is the explosion of information available to us, both now and in the future. Never before have we been so inundated with print, in whatever form it takes. I'm sure I'm not the only one who is sometimes overwhelmed by the amount of reading I need to do each day, particularly online. My personality is such that, when walking a trail, I have difficulty turning around and returning home, preferring to have "just a little peek around the next corner." My teachers called this "an immense curiosity and desire for learning". My son tells me I'm a stickybeak. That curiosity makes it very difficult for me to ignore written words. Deleting an email without reading it is almost impossible, even when it's an automated one. So I am making a May resolution - more ruthlessness when skimming and scanning. They are important skills to have, so naturally, they're important skills to help kids develop. There are many online resources about them, and no doubt they are part of every school's curriculum, particularly in library or information technology lessons. Here's my understanding of them. Scanning is when you quickly check a page or pages out, searching for key words or snippets of information. Skimming really just means reading fast, rather than word by word, to get the main idea. The key to both is being ruthless in repressing my desire to read carefully. I thought it might be useful to look at the methods I use for scanning and skimming, not because they're the best, but because they mostly work for me. • When I get to a page or a screen, I check out the big picture first. I let my eyes track left to right and top to bottom, quickly taking in stand-out features like the presence of a sidebar, table, picture, or bullet points in a list. That's scanning. • Next I narrow my focus a little and read the headings, or subtitles, and any words in special font like bold. I don't really think too much, just get a taste for what's going on. I'm still scanning. • After that, if I'm convinced I am in the right place, I skim the first couple of paragraphs of the bulk of the information. My eyes flick along, trying to work out the main idea of the text. I look for keywords or phrases, and if I find them, quickly read word for word nearby and try to make sense of them. • Finally, I determine exactly what I want to read and concentrate on extracting meaning from the text. What actually happens is I scan and skim, skim and scan, and read, over and over again, rather than it being a linear process the way I've described it above. You know, sometimes when a child IS a voracious reader, it can be a handicap for her. She loves the written word and is keen to read every single one. 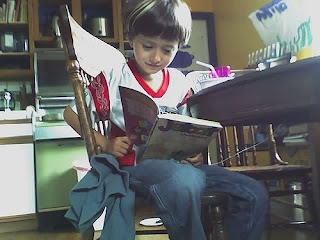 Some kids become so absorbed in a book, they ignore everything else around them, even to the point of skipping meals. (Alas, that part never happened to me.) Scanning and skimming, particularly an informational text, are skills that can help her find the place where she needs to start reading - and practice might help her develop the self discipline she needs to stop! If like me, you simply must read the Vitabrits box or the Vegemite jar because they're there, why not join me in some more skimming and scanning ruthlessness? I plan to prop my book against them and ignore them altogether! You're so right that there is so much information out there that it's important to be able to skim and scan. I find that many children have a difficult time with focusing on the most important details. When they're reading independently, it's important to be able to highlight the most important information. When they're listening to a story or to a lesson, it's important to be able to note only the most important details. Some children are intimidated by so many words, but there are definitely strategies that can be taught to help them to focus on the "big picture." Our world is changing so much, and so is the publishing world. I would hate to think of a world without real books. I love that there's so much information on the internet, but this type of reading can never replace the reading of real literature. It's a completely different experience, especially for children. I hope to never witness a world without picture books! Thanks for your valuable comment, Dawn. I really appreciate that you take the time to tease out your thoughts after reading my posts, because they add such value to my own ideas. I hadn't thought about the listening aspect, and that's equally important as a skill. Books satisfy that part of us that is sensory, I think. As well as being very convenient, I just love the feel of nice pages and the smell of a book, new or old. I like the weight of it in my hands. Babies even like to chew them - try that with a Kindle!